Shop till you drop at Fremantle Markets and Jadran Wines. 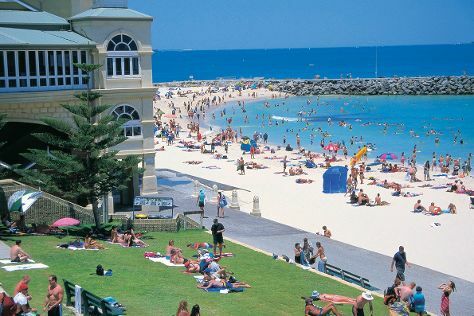 Attractions like Cottesloe Beach and Perth Zoo make great kid-friendly stops. Venture out of the city with trips to Sorrento Beach (in Sorrento), Fremantle (Glen Cowans' Studio at the Roundhouse, South Beach Recreation Reserve, & more) and Mandurah (Dolphin & Whale Watching, Silver Sands Beach, & more). Pack the 21st (Sat) with family-friendly diversions at Adventure World Perth Australia. Make the 2nd (Thu) an awe-inspiring day at Lane Pool Reserve. And it doesn't end there: walk around Kings Park & Botanic Garden, tour the pleasant surroundings at Scarborough Beach, kick back and relax at City Beach, and identify plant and animal life at Caversham Wildlife Park. To find more things to do, maps, where to stay, and tourist information, read our Perth travel planning site . If you are flying in from United Kingdom, the closest major airport is Perth International Airport. Expect a daytime high around 35°C in December, and nighttime lows around 17°C. Finish your sightseeing early on the 5th (Sun) so you can travel back home.